This is used to direct the flow of air. Air can be directed to the floor, instrument panel outlets, or windshield. Five symbols are used to represent Face, Bi- Level, Floor, Floor-Defrost and Defrost air position. Selecting the "Face" mode will cause air to be discharged through the face level vents. the floor vents, windshield defroster nozzle, side defroster nozzle and side ventilator. Air is discharged through the windshield defroster nozzle, the floor vents, side defroster nozzle and side ventilator. 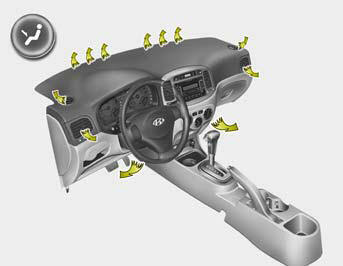 In vehicle equipped with A/C, the A/C will automatically be turned on and "Fresh" mode will be activated. Air is discharged through the windshield defroster nozzle, side defroster nozzle, side ventilator. 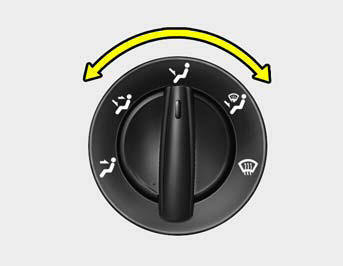 In vehicle equipped with A/C, the A/C will automatically be turned on and "Fresh' mode will be activated. In vehicle equipped with A/C, when "Floor- Defrost" or "Defrost" modes are selected, the A/C will automatically be turned on and "Fresh" mode will be activated to help dry the air. The A/C will not turn off and "Recirculation" mode will not be selected until the air flow control is set to the another mode other than the "Floor-Defrost" and the "Defrost" mode.